On Friday, 4th August 2017, the leader of the Indigenous People of Biafra (IPOB), Mazi Nnamdi Kanu paid a visit to a Jewish High Priest Clifford Aladinbugha Mmenaba at his synagogue in Orlu. Putting a call to the High Priest, the Priest confirmed to IPOB Writers Office that the IPOB leader visited and "his visit was successful". Meanwhile, Mbaise IPOB had received information that the IPOB leader visited Orlu and would pass through Mbaise to pay a condolence visit to a bereaved professor. 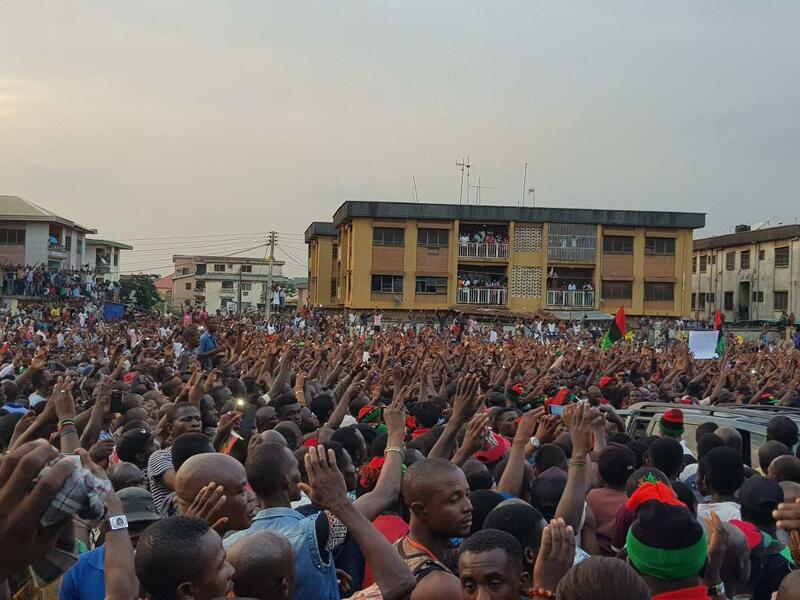 IPOB members and Biafrans trooped out en masse to give an overwhelming welcome to their leader. Present to welcome him were a Jewish Elder, Buruch Pen Adindu, Ichie Emma Ejionu(Omenala Ga-adi 1 - of Mbaise), Prince Will Onyema, Ofoegbu Anthony Ndubisi who coordinated the IPOB members that trooped out. Also, present were the Group of Clergy of Mbaise, Mbaise Sabatharian Group and Mbaise Group of Traditional Ministers. A popular traditional musician called Dr Olololo was live giving melodious tunes. Mbaise people welcomed Mazi Nnamdi Kanu with 21 rounds of Canon shots and as he was leaving, they bid him farewell with another 21 rounds. When IPOB Writers interviewed some of the IPOB members, it was obvious that 90% of Biafrans came very early in the morning under the rain waiting for the IPOB leader who arrived few minutes past six in the evening. Despite the long wait and possible hunger strike that could have been associated with the long wait as it was obvious that no Biafran was ready to miss the arriving moments of the great leader and the heroic welcome that should follow, the shout of the century was recorded and even under the rain Biafrans were singing and marching with great vigour. Meanwhile, IPOB writers had reported earlier that IPOB members trooped out to Ahiara junction from Mbano, Obowo, Mbaise and environs on the 28th July 2017, when the Biafran leader passed through Mbaise to visit Imo state at the state capital, Owerri. With this level of support Mazi Nnamdi Kanu has garnered - as it is indisputable that Biafrans troop out to tell him that they are behind him at anytime news of his visitation or ordinary passage filters in, it is evidential that Biafrans have truly resolved to restore their Republic, Biafra, which was re-annexed to Nigeria after the brutal civil war of 1967-1970. Recall that the Biafran leader, Mazi Nnamdi Kanu has said that there will be no election in Biafra territories until the federal government of Nigeria gives a date for Biafra Referendum, and since after his release from the unlawful detention, he has been taking the gospel of Biafra restoration and Referendum to different parts of Biafra land. And having chosen the path of peace - a referendum- the international community should listen to them and as a matter of urgency wade in to avoid a second civil war which Nigeria may unlikely survive.